It was special day for Cambridge as the royal couple who take their name from the city visted for the first time. Thousands of people took to the streets hoping to see the Duke and Duchess of Cambridge and Prince William and Kate didn't disappoint. They had a packed programme of engagements but still found time to greet the crowds who braved the wet weather to see them. Children from Middleton Primary School in Peterborough have gathered to greet their namesake the Duchess of Cambridge on a visit to the city's hospital. Click here for a report on Jimmy's preparing for the royal visit. 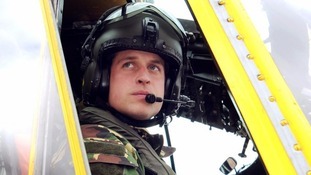 Prince William has spoken of his pride at being created Duke of Cambridge by the Queen when he married Kate Middleton. The Duke and Duchess are visiting the city for the first time since their wedding. The Duke said: "We both feel immense pride at being associated with Cambridge - a place renowned the world over for its dynamism, beauty and learning." He said it wasn't the first time he'd been in Cambridge having been there with his brother five years ago and joked "I have to say it's the closest Harry's ever got to university."